There are two kinds of righteousness—man’s righteousness and God’s righteousness. Man’s righteousness is based on obeying laws and measuring our righteousness by comparing ourselves to others. If we are religious, man’s righteousness is an attempt to achieve God’s requirements for righteousness by obeying His laws. We try to resist temptations—a struggle with only partial victories and many horrible defeats. We make great efforts to do good, to avoid evil, and to please God by trying to do it right the next time. Consequently, man’s righteousness is a terrible struggle, mixed with torment. Whenever temptation turns into failure, we fall into total despair. We become caught in an endless cycle of sin and confess, sin and confess.... We are constantly aware of having done things that are wrong. We mean well. We may truly love God and try to please Him, but we never measure up to the righteousness of God. If this describes your Christian experience, you may be ignorant of God’s gift of righteousness that He provided for us in Jesus Christ!" Romans 10:3-4 For, being ignorant of the righteousness of God, and seeking to establish their own, they did not submit to God’s righteousness. For Christ is the end of the law for righteousness to everyone who believes. Truthfully, even if we kept 99 percent of the law, we would still be condemned before God! We don't have a righteousness He can accept. Even if no one could point a finger at anything in our life, our every action still has to come from an absolutely clean heart that springs from God's pure love. The only righteousness that is acceptable in God's eyes is the perfect righteousness of Jesus Christ our Lord. 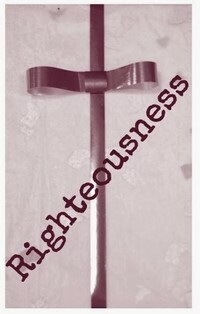 The good news is that God has given us this righteousness through faith in Jesus and what He has done! By faith in Jesus Christ, we become children of God and inherit all that Jesus has. When Jesus departed the earth, He left those who have faith in Him everything He had while He was here. He left us His Name, the Holy Spirit, and a gift of His righteousness. Once we understand this inheritance, we can stand against every devil and demon in Hell. Satan will not be able to condemn us before the Father, nor before our own conscience, because we are an heir of the perfect righteousness of Jesus Christ! Since the inheritance and gift of righteousness cost Him so much, God expects us to value this inheritance! He expects us to seek it above all else, and not our own righteousness nor anything in this world. Matthew 6:33 Seek first the kingdom of God and His righteousness, and all these things will be added to you. The knowledge of God’s gift of righteousness will end all your useless struggles and put you in God's presence justified and accepted. But if you don't have this truth, the devil will play havoc with your feelings. He'll lie to you, deceive you, and manipulate you. Unless you have this truth as a foundation under everything you believe, nothing will be right in your doctrine, your theology, nor your life. You can't comply with God’s commands until you understand this gift He has given you through faith in Jesus Christ! Therefore, we have to be convinced that nothing we can ever do will produce an acceptable righteousness before God. Our righteousness has to come from another source! When we stand at the judgment seat, we can have no other plea of innocence but the righteousness of Jesus Christ. We will never be justified or accepted as holy and righteous before God, unless we stand before Him with Christ's perfect righteousness as our own. After all, that is the only righteousness God will ever recognize. Romans 5:17-19 For if, because of one man’s trespass, death reigned through that one man, much more will those who receive the abundance of grace and the free gift of righteousness reign in life through the one man Jesus Christ. Therefore, as one trespass led to condemnation for all men, so one act of righteousness leads to justification and life for all men. For as by the one man’s disobedience the many were made sinners, so by the one man’s obedience the many will be made righteous. So, how do we receive Christ's righteousness? It has nothing to do with what we have done or accomplished. This righteousness is imputed to us. That means His righteousness is assigned to us. When Jesus imputes His righteousness to us, God looks upon it as our very own. We did not earn it. Christ earned it for us, and God credits it to our account! This imputation comes by faith alone. We can't merit it in any way. Rather, because of our faith in Jesus and His redeeming work, God credits the righteousness of Christ to us, and we are reckoned as perfect in Him. That's right, you and I are credited with the same righteousness that Jesus obtained here on this earth. By believing in Christ, repenting of our sins, and following Him in baptism, we stand before God with an imputed righteousness. And it is a righteousness not of works but of faith in Jesus Christ. This faith comes by hearing the Word of God which tells us that Christ paid for the sin of mankind on the Cross with His own blood; that He fulfilled the law and removed the curse for breaking the law; that He ransomed us from the claims of the devil; that He lived a sinless life, keeping the law at every point; and that He will present us before the Father without a fault. Jude 1:24-25 To him who is able to keep you from falling and to present you before His glorious presence without fault and with with great joy, to the only God our Savior be glory, majesty, power, and authority, through Jesus Christ our Lord, before all ages, now and forever! Amen. Our flesh cries, "No way! It can't be that easy. After all, I still have problems in my life. I still struggle with sin. I haven't yet come to a place where I believe God is pleased with me. I can't expect Him to consider me righteous while I still have so many things needing improvement. I need to clean up my act first." Such a response indicates we have too much pride to believe and accept what Christ has done. We need to be humbled and broken, because a lifetime of self-improvement will not save anyone. God’s gift of righteousness is given by grace through faith in Christ and what He has done. And that faith is not something we conjure up, because a saving faith is also something given to us by God’s grace. Ephesians 2:8-9 For it is by grace you have been saved, through faith—and this is not yourselves, it is the gift of God—not by works, so that no one can boast. This faith will rise above all our fears, above all satanic lies, all feelings, all circumstances, and rest in what God's Word declares. And His Word says that by living a life of faith in Christ and repentance (not perfection), He looks upon us as having the perfect righteousness of Jesus. He accepts us as His children, as holy and righteous! There is no "50 percent perfect" righteousness or "90 percent perfect" righteousness. When God gives us the righteousness of Jesus Christ, we receive it all. The reason we don’t feel perfectly righteous is because we are in the process of sanctification. Everyone, who believes in Jesus Christ, truly repents and is baptized; otherwise, they don’t truly believe Jesus. However, we must not put our faith in our repentance and baptism for righteousness. We must have faith in Jesus Christ, believing in His work on the Cross to make us perfectly righteous in the sight of God. Although God gives us His righteousness, we still undergo the daily process of sanctification by the Holy Spirit. I’ve used that big word “sanctification” twice. What is it? Sanctification is the Holy Spirit enabling us to become in practice—the righteousness that God has given us by faith. It is a life-long process that includes daily dying to self and picking up our cross and following Jesus by listening to and obeying the Holy Spirit. Sanctification is the Spirit of Christ in us—making us to be in reality what God sees us to be already through justification. Plainly stated: God has already made us “just” (or, right) in His eyes, and that is a wonderful gift of righteousness. But now He is bringing this righteousness down to our practical lives. This is the work of the Spirit of Christ in us—to conform us to what God already sees us to be, an image of Jesus Christ. If we accept this truth about God’s gift righteousness, we will never fear what other people say. We will never look at someone else's life and feel unworthy. We can believe, "I have the perfect righteousness of Jesus Christ credited to me by faith! No, it's not mine — it's His. But it's accounted to me by Jesus Himself. If the devil whispers, "You're no good, you have no righteousness," you can answer: "Of course, I'm no good. Of course I have no righteousness in myself. But I do have the righteousness of Jesus Christ! Yes, I've failed God. But I have an Advocate with the Father—Jesus Christ, the righteous!" 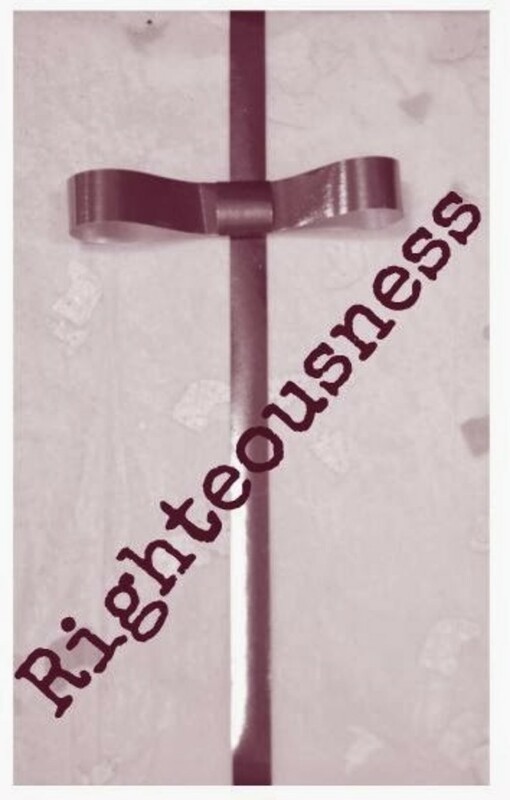 Does this gift of righteousness mean we are not obligated to obey and do good works? No, not at all. Justification by faith, and the imputed righteousness of Christ, sets us free to obey and do good works inspired by the Holy Spirit, who gives us a love for God and others. Because we are no longer imprisoned by fear and condemnation, we obey, not to merit righteousness, but because God’s righteousness is ours by faith. And now we are free and released to serve Him as bondservants of love because the Holy Spirit fills us with the love of God. Therefore, along with Christ’s imputed righteousness, it is God’s will that every believer be filled with the Holy Spirit in order to have grace to obey and do good works. It is God’s will that we live a holy life, dedicated to His purpose, so He gives us the Holy Spirit to accomplish His will. The grace and power of the Holy Spirit turns us from all iniquity and enables us to live out the righteousness God has given to us. 1 Thessalonians 4:3-8 For this is the will of God, your sanctification: that you abstain from sexual immorality; that each one of you know how to control his own body in holiness and honor, not in the passion of lust like the Gentiles who do not know God; that no one transgress and wrong his brother in this matter, because the Lord is an avenger in all these things, as we told you beforehand and solemnly warned you. For God has not called us for impurity, but in holiness. Therefore whoever disregards this, disregards not man but God, who gives his Holy Spirit to you. Jesus, was filled with the Holy Spirit, and overcame sin, flesh, and the devil. Therefore, Jesus sent the Holy Spirit to be our sanctifier and to give us power to overcome sin, the flesh, and the devil. After all, do you think God would justify us but then leave us totally powerless against the principalities and powers of darkness? Do you think He says to us, “I consider you righteous by your faith in the accomplished work of my Son; now, go—resist sin and fight the devil as best you can; I’ll give you credit for a good effort”? No, never! By the grace and power of the Holy Spirit, we are to reign over every demonic power, every lust, and every principality that comes against us. Christ did not do battle with the devil, defeat him, return to the Father and then quit on us. He did not merely say, “I did my part. Now, you do yours.” No, our blessed Savior ascended to heaven and He sent us His Spirit, who enables us to be victorious! We are never to face the tempter in our own strength. Nothing we have is adequate against him and our lusts and habits. However, in the Name of Jesus, we can resist the tempter and rebuke him when we face his temptations and attacks, because we have the Holy Spirit in us that is greater than any demon in this world. 1 John 4:4 Little children, you are of God and have overcome them, for He who is in you is greater than he who is in the world. The Holy Spirit empowers us in all battles with the flesh and the devil. However, we are victorious only when we die to self and allow the Spirit of Christ to live His life in us and through us. All power over sin, flesh, and the devil lies in the indwelling Spirit of Christ. Therefore, be fill with the Holy Spirit, listen to Him, and obey Him. Our part in achieving righteousness is simply to acknowledge that our own efforts are useless. Jesus alone has the power to purify us. And that power is available to us only as we rest in knowing we are children of God—and that He loves us so much that He gives us the righteousness of Christ and His Spirit to lead us every day. Therefore, we must submit to the Spirit of Christ—calling upon Him in trust, crying out, “Lord, I can’t do it, but You can. I turn it all over to You.” Then listen for Him to speak. When He speaks to you, the inevitable result is always peace. Your Father loves you. Now, love Him back as a child with everything you say and do. Begin with obeying whatever He is telling you right now. If He is saying, give your life to Jesus, and you believe Jesus is the Son of God who died to save you from Hell by atoning for your sin on the cross, then make a public confession of this faith. Repent of your sin and self-rule by dying to yourself in baptism so you can receive God’s gift of righteousness and be born again of the Holy Spirit who will sanctify you daily as He conforms you to Jesus Christ.